You have located a great piece of property for your dream homestead. But one problem is there is no electrical power to it. You are considering a Grid Tie Solar or an Off Grid Solar Electrical System. There are advantages and disadvantages to both Grid Tie Solar Systems and Off Grid Solar Systems. These advantages and disadvantages need to be understood before an intelligent choice as to which power system, Grid Tie Solar or Off Grid Solar would be the best choice best for your homestead. How Far Away Is Public Utility Power? The distance public utility power lines would have to run to give your homestead electrical power plays a large role in deciding which type of Solar Power you can afford. I know of a situation where underground electrical power only needed to be run for 150 yards. The property owner had to dig the trench, buy and place the meter base and pay for the power company to lay the underground wires to the meter base. His cost for this was about $1,500.00. It is not uncommon for a power company to charge over $10,000.00 to place utility poles and run power lines for as little as 1 mile. Clearly one of the factors to be considered in deciding whether to have a Grid Tie or Off Grid Solar Power System is the cost to get public power to the homestead property. What Are Your Anticipated Electrical Power Needs? Many homesteads do not have electric water heaters, electric stoves or electric heat pumps for heating and cooling. These electric appliances require 240 volt electricity to operate. If the homestead is in an area that requires an Aerobic Septic System that septic system also requires 240 volt electricity 24/7. Instead of 240 volt appliances many homesteads have propane water heaters or solar water heaters, propane stoves that do not have an electric glow bar to light the oven. For heat they use oil heat, propane heat or heat with a wood burning stove. If the homestead is in a hot or hot and humid climate, air conditioning would be a welcome or necessary addition. I know several homesteaders who have propane hot water heaters, propane stoves and heat with wood stoves. They either live at an area where air conditioning is not needed or in an area where their house is shaded and catches breezes that keep it a comfortable temperature in summer. Some of these homesteaders have shops where they use electrical welders and other large power tools from time to time. Many of them live Off the Grid and when they need to use the welder or other large power tools they power them with an electrical generator that is gas or diesel fueled. They know how to safely keep gas or diesel in long term storage. Most people visiting an Off Grid home would find a variety of 120 volt electrical appliances and electronics being used and probably would not notice the absence of 240 volt appliances. Unless you are independently wealthy, an Off Grid Solar System large enough to allow for the use of 240 volt appliances could be cost prohibitive. If you were to choose Grid Tie Solar Power you could use any 240 volt electrical appliance you desired. but there are trade offs to be considered. What Are The Chances Of Power Outages At The Homestead Location? In rural areas there is an increased chance of power outages lasting longer than in urban or suburban areas. This is simply because it takes longer for a crew to locate and repair the problem in a rural area. The incidence of power outages is about the same as in urban or suburban areas. Power outages will become important when we analyze Grid Tie Solar Power Systems. How Do You Plan On Handling Power Outages? As mentioned above, power outages in rural areas can last longer than in urban or suburban areas. We have experienced power outages on our homestead that have lasted an entire day or longer. If it is mid-winter, the temperature is in the teens, and you have an oil furnace or a propane furnace and the electricity is off so the blower does not work, the house can get quite cold in a few hours time. Fortunately we have a wood burning stove that keeps a portion of the house warm and gives us a way to warm up soups and drinks when the electricity is off. Many rural residents have at least a 5.5 KW generator such as the Westinghouse WGen 5500 (link to read reviews on Amazon). Many homesteaders prefer to have a 9.5 KW like the Westinghouse Heavy Duty WGen 9500 (link to read reviews on Amazon). Those with a large house over 2000 square feet would want a 12 KW generator such as the Westinghouse WGen 12000 (link to read reviews on Amazon). These generators give them some power or a lot of power depending on the generator size during power outages. These come in handy in winter time when even a 5.5 KW generator can keep the blower on an oil or propane heater going and supply some power for lights and a refrigerator. The most common solar power system in America today is a Grid Tie Solar System. This system can be found where public utility power is available. 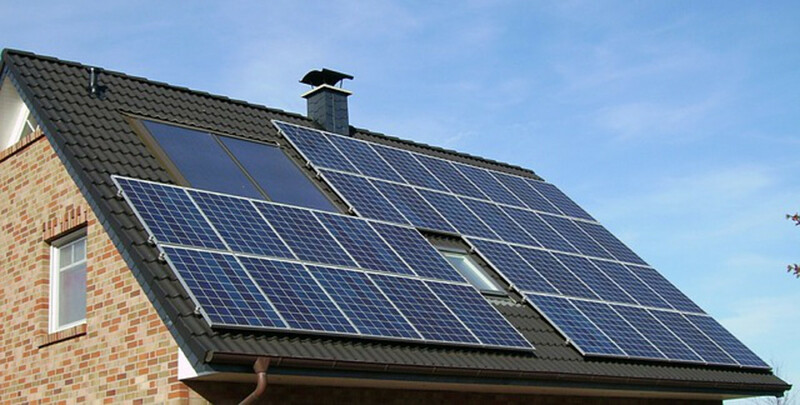 Grid Tie Solar Systems have become popular because they reduce your monthly electrical power bill. In some areas of the country any excess power generated by the Grid Tie Solar System can be sold to the power company and you get a check for the power sold at the end of the month. In other parts of the country the excess power generated by the Grid Tie Solar System is deducted from the public utility power you use. This reduces your electrical power bill each month. What is not always understood is that a regular Grid Tie System only produces power when the electrical grid is working. If the power grid goes down, there is no power delivered to the home, even in the middle of a sunny day! This is because Grid Tie systems are designed to shut down in a power outage to prevent electrocuting linemen repairing the power grid. 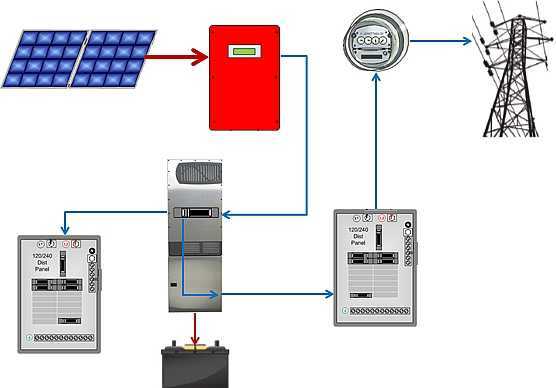 In the typical Grid Tie System the Solar panels feed electricity through a Grid Tie Inverter which converts the DC power generated by the Solar Panels into AC power. This AC Power is then fed through the electrical service panel, (circuit breaker panel), and out through the electric meter and into the power grid. The electrical power is fed backwards through the electric meter and this turns the meter backwards reducing the cost of power charged for by the electric company. If you live in a part of the country where the electric company will pay you for the excess electricity produced by your Solar Panels, you will get a check at the end of the month. The Grid Tie Inverter only feeds electrical power through the Service Panel, (Circuit Breaker Panel), when it detects power from the electrical grid. If no electrical power from the grid is detected, the Grid Tie Inverter shuts down so as not to place electrical power into the grid and run the risk of electrocuting a public utility lineman repairing the grid. So when the electrical grid goes down, even on a bright sunshine day, there is no power converted from DC to AC and the house has no electrical power! Likewise, if the electrical grid goes down at night, there is no power generated by the Grid Tie Solar Panels and there is no electricity to the house. So a Grid Tie Solar System only works when the Electrical Utility Power Company's Grid works. In that respect, the only benefit derived from a Grid Tie Solar system is reduced electrical power costs after the cost of the system is paid for by the lower electrical power costs. It can take several years to recoup the cost of the Grid Tie Solar System. In the Off Grid Solar System you have the Solar Panels which produce DC electricity. The DC electricity goes to an Inverter where it is converted to AC electricity. The Inverter sends AC electricity to the Circuit Breaker Box to power the house. The Typical Off Grid Solar System produces 120 volt electricity. When excess electricity, more electricity than is being used, is produced by the Solar Panels, the Inverter sends the excess to the Battery Bank where it is stored for future use. The larger the Battery Bank, the more electricity can be stored for future use. When the sun goes down, the Inverter takes DC electricity from the Battery Bank, converts it into AC electricity and sends it to the Circuit Breaker Panel to power the house. The Charge Controller keeps the electricity in the Battery Bank from being pulled out by the solar panels at night. An Off Grid Solar System usually has a generator connected to it. The purpose of the generator is to recharge the battery bank and supply electricity to the Inverter when there is not enough sunshine for the Solar Panels to make the electricity needed and charge up the Battery Bank. An Off Grid Solar System is not connected to the electrical power grid. It is not dependent on the electrical power grid to function. The addition of a Battery Bank and generator increases the cost of the Off Grid Solar System over a Grid Tie System. However, the Off Grid Solar System does not go down whenever the electrical grid goes down. There is maintenance to keep the battery bank performing at peak efficiency and the need to store fuel for the generator that is not a cost with a Grid Tie Solar System. On the other hand, if you needed to pay for a mile of Electrical Power Lines to bring electricity to the homestead, that cost is more than the cost of a Battery Bank, generator and storing fuel. A Grid Hybrid System is an attempt to create an acceptable cross between and Off Grid Solar System and a Grid Tie System. This Hybrid System has three additional components not found in a Grid Tie System. They are; a Critical Load Center, (pictured on the left), a Battery Based Inverter and a Battery Bank. This system uses what is called AC Coupling to store power in a Battery Bank. In this system the power flows from the Solar Panels, (DC electricity), to the Grid Tie Inverter, (which converts the DC electricity from the Solar Panels to AC Electricity), to the Battery Based Inverter. The Battery Based Inverter sends AC Electricity to a Critical Load Circuit Breaker Panel which is a smaller Panel which sends electricity to a few critical electric circuits. The Battery Based Inverter also sends power to the Battery Bank and to the Whole House Circuit Breaker Panel. From there electricity goes through the Electric Meter, backwards, and into the Electrical Power Grid. By going through the Electric Meter backwards, it reduces the power you pay for each month. When the Electric Power Grid goes down, the Battery Based Inverter has an internal switch that prevents electrical power from flowing through the Whole House Circuit Breaker Panel and out into the Public Utility Power Grid and preventing electrocuting a lineman. As long as the Solar Panels are producing DC Electricity, the Grid Tie Inverter sends AC Electricity to the Critical Load Circuit Breaker Panel. This panel sends electricity to a few Critical Load Circuits. This allows there to be electrical power to a few circuits even when the Electric Power Grid is down. When the Solar Panels quit producing DC electricity the Battery Based Inverter will convert DC Electricity from the Battery Bank to AC Electricity and send it to the Critical Load Circuit Breaker Panel. So there will be some electricity to critical circuits even during the night. As long as the battery bank has DC electricity for the Battery Based Inverter to use. It needs to be noted that this is a Hybrid System. That means it is a cross between a Grid Tie System and an Off Grid System. It has all the features of a Grid Tie system but only some of the features of an Off Grid System. The Grid Interactive or Hybrid System does not power all of the electrical circuits in the house when the electrical grid goes down! It only powers a few critical circuits such as the blower on an oil or propane furnace, the circuit the refrigerator is on and maybe one electrical circuit for lights and one electrical circuit to plug electronics into to charge them. The Battery Bank in a Grid Interactive or Hybrid System is much smaller than the Battery Bank in an Off Grid Solar System. It is usually sized to last no more than a day while only powering those few critical circuits. It is important to understand that if there was to be a natural disaster or other event that took down the Electrical Power Grid for an extended period of time, that a Grid Interactive or Hybrid System will only give battery power for about a day. If there was not enough sunshine during a grid down period of time due to a natural disaster, to power the critical circuits during the day and to recharge the Battery Bank, you would be without electricity a large portion of the time. To have battery power for a longer period of time would require a generator and fuel to last as long as the Electrical Power Grid was down. A natural disaster in mid-winter time that takes down the Electrical Power Grid for a long period of time is not what a Grid Interactive or Hybrid system is designed for. Another important thing to factor into a Grid Interactive or Hybrid System is that when the electrical Power Grid is down, the Battery Bank and the Battery Based Inverter are not designed to give 240 volts of electricity. This means there is no power for electric water heaters, electric ranges and oven, electric heat pumps or an Aerobic Septic System. In my experience there are very few Real Estate Agents and Brokers who are knowledgeable about any type of Solar System. This means it is necessary for you to have enough knowledge that you can look at a Solar System and tell if it is a Grid Tie, Grid Interactive or Off Grid System. Remember, if it is a Grid Tie System you only have electricity while the Public Electric Utility System is generating electricity! When the Public Electrical Utility System goes down you have no electricity. In that case the Solar Panels and Grid Tie Inverter are useless. If it is a Grid Interactive System you will have some electricity to critical circuits for up to a day's time if the Public Electrical Utility System is down. How long you will have electricity to those critical circuits also depends on how much the sun shines while the Public Electrical Utility System is down. If it is an Off Grid Solar System you will have 120 volt electricity when the sun shines, for as long as the battery bank can supply electricity and if the battery bank needs recharged, there is a generator to top off the batteries. A good Off Grid Solar Power System gives dependable power for years with a little TLC and maintenance of the batteries. To convert a Grid Tie system to an Off Grid System could involve adding more Solar Panels. The Grid Tie Inverter is not suitable for an Off Grid system so you would need an Off Grid Inverter. You would need to have a Battery Bank sized for your particular needs and have a suitable generator to charge up the Battery Bank when there was not enough sunlight to keep the Battery Bank charged up. In addition you would need to hire an Electrician who was knowledgeable in Off Grid applications. He would have to disconnect your Circuit Breaker Panel from the Electrical Meter and the Public Utility Power Grid. Then the Off Grid Inverter would need to be installed and connected to the Battery Bank and the Circuit Breaker Panel. Lastly, if there were any 240 volt electrical appliances in the house they would need to be replaced. An Electric Water Heater would need to be replaced with a Propane or Solar Water Heater. An Electric Stove and Oven would need to be replaced with a Propane Stove and Oven without an Electric Glow Bar in the oven. An Electric Heat Pump would need to be replaced with an Oil or Propane Furnace or a proper sized and placed Wood Stove for heat. If there was an Aerobic Septic System it would have to be replaced with an Anaerobic Septic System if that was allowed by the Local Health or Sanitation Department. That alone could cost several thousand dollars. If the house is on an Aerobic Septic System and I wanted an Off Grid Electrical System I'd scratch that house off my list of possible places to live. Converting a Grid Interactive System to an Off Grid System could require installing more Solar Panels. The Grid Tie Inverter and Battery Based Inverter are not suitable for an Off Grid System. Those inverters would need to be removed and replaced with an Off Grid Inverter. The small Battery Bank would need to be replaced with a Battery Bank sized to the capacity you need. The Battery Bank would need to be connected to a generator to charge the Battery Bank when there is not enough sunshine for the Solar Panels to keep the Battery Bank fully charged. You would need an electrician familiar with Off Grid Solar Systems to disconnect the house's electrical system from the Electric Meter and the Public Electrical Power Grid. Then there might need to be some rewiring of the circuits in the Critical Circuit Breaker Panel to the main Circuit Breaker Panel. Then as in the conversion from Grid Tie to Off Grid, any 240 volt electrical appliances would need to be removed and replaced with appliances suitable for an Off Grid house. A 240 Volt Electric Water Heater would need to be replaced with a Propane or Solar Water Heater. Any Electric Stove and Oven would need to be replaced with a Propane Stove and Oven that does not use an Electric Glow Bar in the Oven. If there was an Electric Heat Pump it would need to be replaced with an Oil or Propane Furnace or a proper sized and placed Wood Stove for heat. If you find a homestead with a Grid Tie Solar System but you want to convert it to an Interactive Solar System or an Off Grid Solar System, find out the cost of the conversion to the system you desire. Then factor into your negotiations that additional cost. If the cost was $5,000.00 to convert to the system you desire, I'd reduce my offer on the homestead by at least that amount. Remember, in negotiations the first person to mention price loses. If you want to convert to a different system and you only reduce your offer by the amount of the conversion you will most likely lose. The counter offer will be higher than your offer. I'd reduce my offer by say $10,000.00 to give me room to negotiate toward the price I want to pay. It is always better to start lower and come up in price than to start with your best price first. What Is Wrong With A Grid Tie or Grid Interactive System On A Homestead? There may be nothing wrong with either system on a homestead. That decision is up to the homesteader in question. I personally would prefer at least a way to know I would have some power during a power outage. In that respect, I'd prefer a Grid Interactive System over a Grid Tie System. Isn't Converting from a Grid Tie or Grid Interactive System to an Off Grid System Expensive? Yes it is expensive. There are a lot of changes that need to be made and those changes require an experienced electrician who knows Off Grid Systems. You can't use just any electrician! One of the reasons for going into all the changes needed in converting from Grid Tie or Grid Interactive to Off Grid was to help people understand the differences between the systems. A Grid Tie System is relatively simple compared to the other systems. But in some cases it could be simpler and less expensive to look for a homestead with the Solar System you'd prefer instead of spending the time and money to convert from what you found to what you want. Which Is Best, A Grid Interactive Solar System or an Off Grid Solar System? That is a mater of opinion. In some instances a Grid Interactive Solar System would work just fine. However, in a situation where there was a natural disaster that took down the Electrical Power Grid for a prolonged period of time, a Grid Interactive System only gives electricity to critical circuits. In my opinion, I'd rather have an Off Grid System sized for my needs in a prolonged grid down situation no matter why the grid went down. I would rather have the option of all circuits receiving electricity than just a few. I also like the option of generator back-up for times when there might not be enough sunshine to fully charge the Battery Bank. As far as storing fuel for a generator, a lot of fuel can be stored safely for a long time at a minimal cost.